LinkedIn’s B2B Forum at Advertising Week Asia 2017 in Tokyo, Japan, brought together some of the best marketing minds in the world. We’re delighted that the B2B Marketing Forum inspired some great questions about the future of B2B marketing. We’ve summed up five of the biggest questions from the Forum for you. 1. What are some of the biggest challenges in B2B marketing today? The B2B buying process has always been complex — in part because there are a large number of decision makers and influencers involved (anywhere from seven to 20 people across three to five departments). LinkedIn helps by enabling marketers to reach these professionals. There are 500 million members on LinkedIn globally and, according to Assaf Tarnopolsky, LinkedIn Marketing Solutions Director for Southeast Asia & North Asia, two new members join the platform every second. 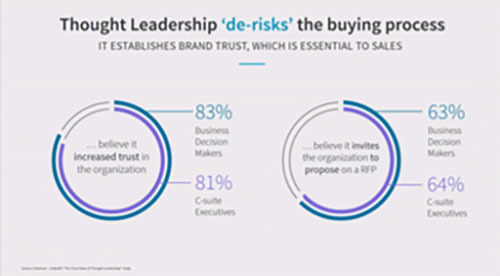 Thought leadership, Dasgupta suggests, can help overcome this challenge by de-risking the B2B buying process, increasing brand trust, and opening the door to sales opportunities. 2. What are some of the biggest opportunities in B2B marketing today? During the Forum, Dasgupta suggested that one of the greatest challenges in B2B marketing is building brand trust in a crowded marketplace. At the same time, he also said that earning trust is most effectively achieved by employees, rather than brands themselves. “People trust people like themselves, more than they trust even the most established brands,” he said. His data revealed that when an employee shares the same piece of content that a company shares, the employee gets twice the click-through rate. 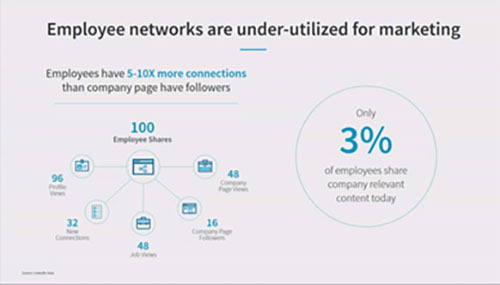 Employee advocacy was his short answer to this big question — but companies must encourage their employees to share content, because only 3% of employees share company-relevant content today. 3. If there were just one thing that all B2B marketers should do, what would it be? 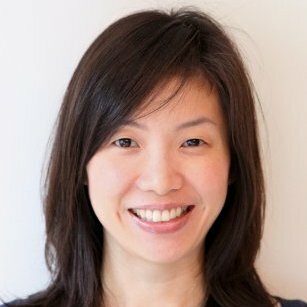 Tarnopolsky, Dasgupta, and Edward Bray, LinkedIn’s Director for Marketing in Asia Pacific, all agreed that brands today should not only have a content marketing strategy, they should have an always-on content marketing strategy. 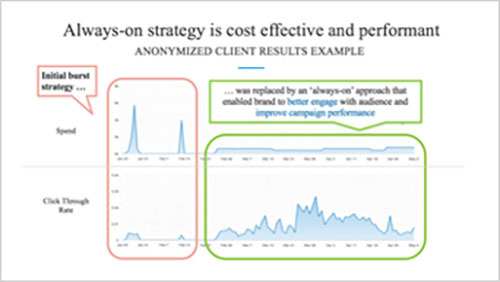 Using anonymized client data, Dasgupta illustrated how, when advertising spend is used in a quick burst, customer engagement peaks then fizzles out. But when the budget is spread over a period of time, engagement levels are higher and sustained over a much longer time. 4. Does an always-on content strategy mean always creating new content? Not really, Bray said. He shared that the LinkedIn Marketing Solutions team likes to start with a Big Rock — a meaty, substantial piece of content developed to answer customers’ top-of-mind questions. Keyword research can offer some insights as to what these questions are. From there, the team “slices it into different pieces like leftover Thanksgiving turkey,” he said. While the Big Rock content should be gated, which means customers exchange their data (like an email address) for access, the smaller slices can be used to whet customer appetites on an ongoing basis. 5. How can sales and marketing teams work better together? To answer this question, Bray pulled out a graph that he regularly uses in his own conversations with sales leadership. For context, he shared that LinkedIn introduced a global content marketing strategy around 2014 and a regionalized one in 2016. 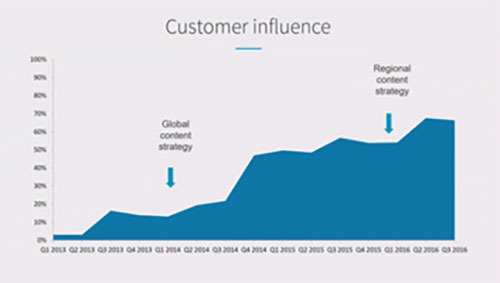 As the graph illustrates, this approach has helped drive a significant increase in customer influence, and correspondingly lead volume. By delivering strong results, content marketing has fundamentally changed the sales-marketing dynamics internally, according to Bray. One is no longer a support function of the other; instead both are working in tandem and toward the same business and revenue objectives. For more insights, you watch the full replay of the LinkedIn B2B Forum here or reach out to us at lhongkong@linkedin.com. And don't forget to subscribe to the LinkedIn Marketing Solutions blog today.